There’s nothing I love more on the weekends than curling up under a blanket so soft that it feels like it’s made from a thousand cats, watching hot British men, and drinking wine. Well someone must have heard my prayers, because this post about The Wine Show TV review on Hulu is clearly biased. 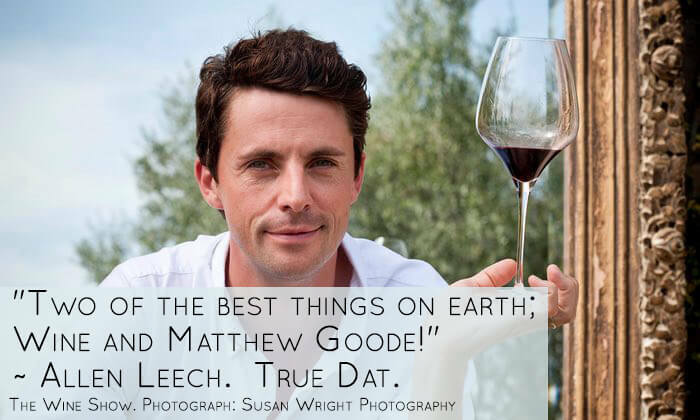 The Wine Show features two of the most charming Matthews’ ever to grace the small screen – Matthew Rhys and Matthew Goode and makes me giddy with delight. I stumbled across it a couple of weeks ago when I finished my latest binge weekend binge watching marathon of the sci-fi epic series 12 Monkeys. Did you know there’s a whole category on Hulu dedicated to British programs? Yes Hulu, Mummy’s very pleased. Well done. 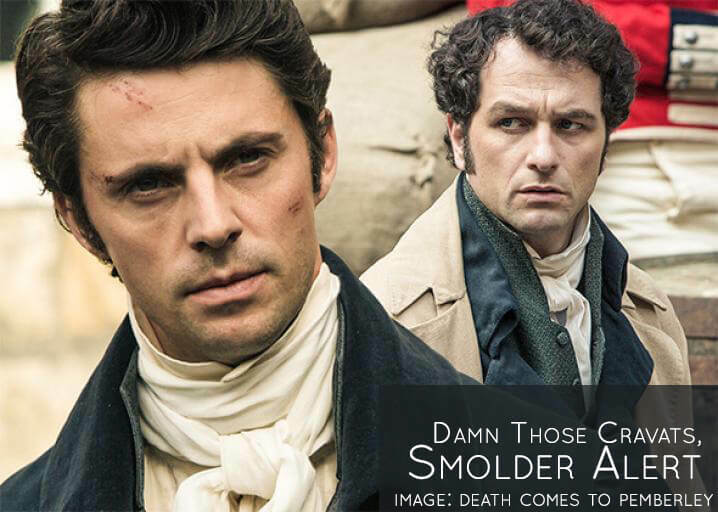 I only started watching it this past Sunday, because when I first watched the trailer and I saw Welch actor Matthew Rhys (The Americans on FX, and the deliciously moody Mr. Darcy, from Death Comes to Pemberley) and English actor Matthew Goode (The Good Wife, Downton Abbey, and the charmingly wicked Wickham from Death Comes to Pemberley) I couldn’t bear the gorgeousness. These two delightful actors are so handsome you have to wear shades. So, I did what any grown still slightly hormonal woman would do, I drank some more wine and watched a spy flick instead to pass the time. Well this past weekend since I somehow slept weird and twisted my ankle so painfully, I couldn’t do anything on Saturday other than get a face peel, drive home, and limp back to my couch. I know, I know you feel dreadfully sorry for me…save your eye-rolling Susan, when your rug rats are grown and your husband finds a hobby that keeps him in the garage for 70% of the time then you’ll know the bliss I speak of, until then count the days. I mean I could always whip out the divorced, sad, and lonely card. But that would be a heinous lie. I’ve never been happier to have no one ask me random stupid questions or stare at me like I’m the last piece of chocolate cake. Okay, well the latter I’d like the former not so much. On Saturday I finished season five of The Americans, I love Matthew Rhys (the beard is growing on me, still not a fan – but I’m making peace with it) and Keri Russell. They are amazing in this series. If you love intrigue and want to watch one of the most complicated spy series on television, tune into it. The pair play married undercover KGB agents living in America. You won’t be disappointed. (You can catch up on the seasons on Amazon Prime.) To add to my overall happiness for these two fascinating actors, they’re together in real life, and they had a baby! The two Matthews’ have a comical bromance that makes the show even more amusing to watch and the fact that the setting is a picturesque Italian villa doesn’t hurt either. The Matthews’ admit to being wine novices – which let’s face it ALL of are, unless you’re a certified sommelier I don’t want to hear it. There’s nothing wrong with being a perpetual student of the vine. See what I did there? Ok, lame, but worth a chuckle. The expert guides are the adorable Joe Fattorini and Amelia Singer. Each episode of The Wine Show is divided into segments that focus on little known wines from far flung countries such as South Africa, Chile, Australia, Moldovia (somewhat terrifying), and even Israel. There are a lot of wine surprises. The experts discover little-known wineries like Caduceus Wines made in Arizona (Arizona, who knew?) by former Tool front man Maynard James Keenan. I cannot wait to try his wines. I ordered Merkin Vineyards 3 bottle mix. Joe then sends the pair off on a mini challenge where they must find the best wine that shows off an aspect of Italian wine culture. This is where most of my giggles happen. Further in the series Joe Fattorini buys a barrel of wine at auction. Yes, a live auction. The poor guy is so nervous you can see every vein on his shiny bald head throbbing. He’s living my dream. The Matthews’ are having such a great time exploring and are genuinely thrilled to taste wine (I mean who wouldn’t be). You’ll find yourself wanting to rent a villa in the Italian countryside with your best friend and tool around in a tiny Fiat listening to the GPS give you directions in Italian. Ahh…bliss. The Wine Show TV doesn’t play on the supposed snobbery and mystique of wine. Instead the Matthews’ who have been friends for years are discovering what tastes, styles, and blends of wine they like as they drink along the way. They may not know tasting notes, but they know what they like and that’s how you should choose wine. With smart comebacks and witty dry humor, sayings like “Death or Glory?” When sipping an unknown wine for the first time it’s hilarious. Not everything they sip is enjoyable. The pair are honest and show when they don’t like a certain wine. They’re outraged at a $150 bottle of wine, just like we would be. They’re vocal on the ludicrous expense of some of the wine gadgets featured. One such gadget is a $2000 computerized decanter that pumps medical grade oxygen into your wine, so a two hour decant time is reduced to five minutes. I’d rather plan my dinner party a little more effectively. I’d allow for the two hours needed before serving my main course and stick the cash in my retirement account. Sure they’ve got inside access to some of the most exclusive restaurants and locations, want to see the home of Mona Lisa, the subject of Leonardo DaVinci’s famous portrait? Watch , you won’t be disappointed, and discover the home of Chianti Classico. Remember, look for the black cockerel. The clever thing about this show is the two Matthews’ make you feel like you’re a part of it too. I’d be offended if you didn’t watch with a glass of wine in your hand. There are additional segments that pair wine with food, the wine is chosen first and then the food compliments it, pure genius. There’s one segment in episode six where chef Clare Symth of Gordon Ramsay’s London restaurant recommends an exquisite and rare white Burgundy Bâtard-Montrachet, Domaine Morey-Coffinet 2005, click here for an alternative white Burgundy, with an outrageous turbot fish recipe. Now, I’m going to harass my local fish shop for fresh turbot. If you don’t have Hulu get it and watch The Wine Show TV starting tonight. Go on grab a glass and I promise you’ll be thrilled that you did. 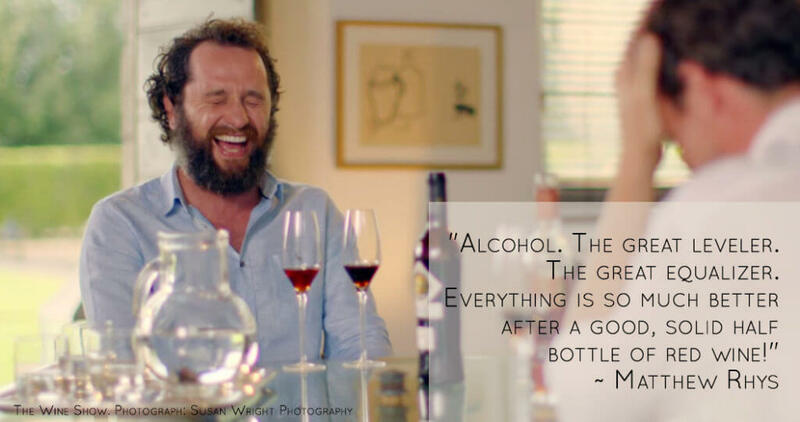 The Wine Show is a rare treat of smart, good, adult television. Now, let’s all email Hulu and get them to make the second season in Napa and Sonoma a reality. Thank you for this Alexandra, we’re so pleased you enjoyed the show. We have *just* finished filming series two. And California features too…! That vein is still thumping on my head as they threw in a few new challenges this time too.